Virtually ZERO clean up! Yep. You read that correctly. Just line your sheet pans with parchment paper before sticking them in the oven and the only things you’ll need to clean are utensils! It’s a great way to let kids help you prep dinner. Let them arrange the veggies and starch choices on the pan and if they’re old enough, you can even let them help chop some things up. Quick and easy sheet pan dinners are great for weekend meal peppers too. See the pictures below for great ways to store your meals and have dinner ready to go all week long. And to add flavor, you definitely want to use things like spices, oils, cheese, herbs, etc. to spice things up a bit. 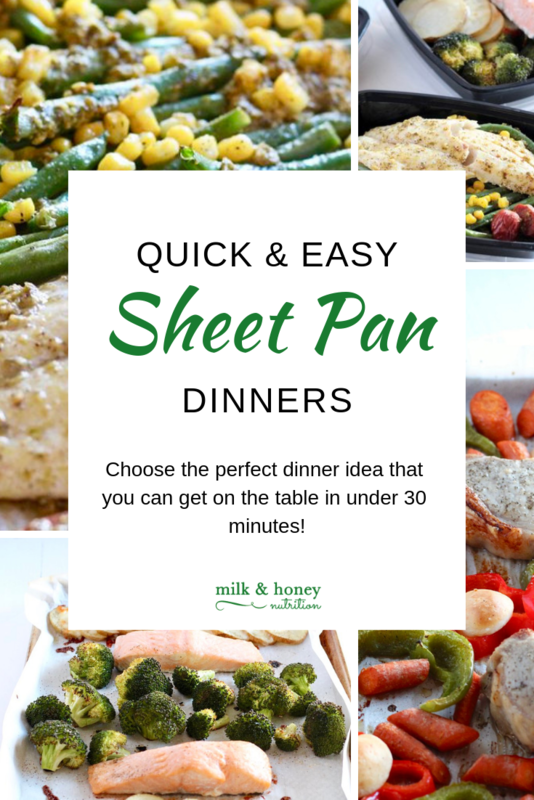 Below are three of my favorite quick and easy sheet pan dinners! Enjoy! Arrange the sausage and snapper in the middle of the parchment lined sheet pan. Next spread the fresh green beans and thawed corn around the edges. Sprinkle the entire pan with the lemon juice, salt, and pepper. Next, using a basting brush, brush everything with the pesto. Bake on 425 degrees for 10 minutes. Arrange the salmon in the middle of the parchment lined sheet pan. Next spread the broccoli and potato slices as shown. Sprinkle the entire pan with the salt and pepper, and then spray with avocado oil. Sprinkle lemon juice over the broccoli and salmon. Next, dividenthe mozzarella cheese in half and sprinkle over the potatoes. Bake on 425 degrees for 15 minutes. Arrange the pork chops in the middle of the parchment lined pan. Next arrange the bell pepper slices and carrots, along with the brazi bites around the outside of the pan. Next, rub both sides of each of the pork chops with avocado oil and drizzle with the juice from one lime. Next sprinkle the veggies and pork chops with the salt and pepper. (You can also spray the veggies with oil at this point if you’d like.) Cook on 425 degrees for 25 minutes. Enjoy!